Every so often (and far less than I wish I could muster) I go on a cycle ride with friends. Not only is my day job predominantly sedentary, but I really like the sense of occasion, being in the glorious countryside which Yorkshire offers with abundance, but also the sense of achievement one gets from being able to move a somewhat less-than-toned-to-perfection self a far enough distance on my trusted Trek hybrid bike. Fear not – no grotesque pictures of me in skin-tight Lycra which could be mistaken for a few root vegetables shoved into an old stocking – I want to keep my followers on Love the Kitchen captivated – not repelled. I tend towards the baggy, and certainly not those cycling shorts worn without any dignity with padding jabbing out like a baboon’s rear end. Occasionally, (and there really is some point to this preamble) we may venture on a sizable journey on two wheels which got me thinking- why not have a decent and filling breakfast which is really quick to reheat (when made the day before) and tastes just as good the second or third time? I must have make these three of four times to date – each time making a slight variation to this recipe so as not to bore my fellow cyclist friends – to be honest, I have had no complaints to date so must be on the right track. This recipe takes just a few minutes to prepare, and, like most of the recipes I post on Love the kitchen really do attempt to minimize the use of too many pans, utensils and the like – there is no point when time poverty itself is such as issue to have to end up cleaning and scrubbing kit and caboodle for an hour after after the meal. Wherever I can, I try to minimise and reuse the same equipment (even if it means a quick rinse or wipe down). I strongly advocate an investment in a good quality and thick kitchen foil- lining, greasing then disposing of foil is much quicker (and cooks a lot more efficiently) than using a not stick pan, having to soak them scrub it for an age. Believe me. In addition, I have taking up the idea of skewering whenever I can – ultimately the aim is to emulate the benefits of a grill/ barbeque – but without the dependency of good weather, and can all be achieved in a conventional oven. I will certain elaborate on this method in due course, but for now will focus on a technique I have not yet seen – skewered sausages in an oven. Whilst grilling can be considered a more healthy option that frying sausages, it can leave one hell of a mess to the grill pan and the cooking elements when the fat drips or spits back. The sausages have been skewered and suspended above the base of a foil lined tray so that the fat drips out of the meat. My previous technique involved lining a deep pan with tin foil then turning over 2-3 times for 30 mins or so- however, I really was not the fan of having sausages sit (or swim, depending on the fat content) and often cook inconsistently, let alone end up in a pool of gunk. My approach is to skewer the sausages using good quality stainless steel skewers and have them suspended. Turning them over using a pair of tongs is an absolute breeze. I have also started to cook a number of other things using this method- it is just a matter of time before I publish related recipe and ideas. 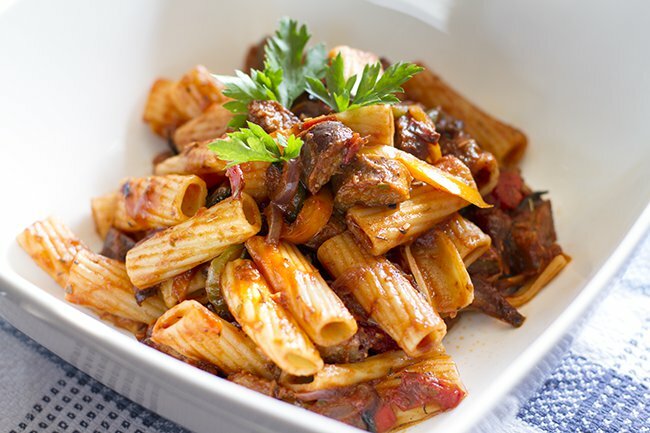 I really hope you enjoy the end result of my spicy sausage and roasted vegetable pasta recipe, and as ever, please feel free to share or comment. If you think it could be improved or adapted, please let me know. Preheat oven to 200C, and line 2 x deep oven trays with good quality thick kitchen foil. Lightly grease one of them with olive oil. In a large mixing bowl, add the sliced peppers, red onion and courgette, and season well with salt, pepper and herbes de Provence. Drizzle over the olive oil, balsamic vinegar, add red chilli and garlic, and mix thoroughly using salad spoons. Pour into the greased foil lined oven tray, and spread out the vegetables as evenly as possible. Meanwhile, bring a large pan of slightly salted water and cook per the packet's instructions. When al dente, drain in a colander and set aside with the lid of the pan to retain the heat. Return the pan to the heat, and add the passata, red wine and gently bring to a gentle boil. Remove the harder ends of the sausages, then cut each sausage vertically, then into bite-sized half-moon pieces. add to the pan, along with the roasted vegetables and warm though. Gradually add the pasta and mix through thoroughly using a large spoon until even evenly evenly coated.Add an extra drizzle of extra virgin olive oil (optional) and season again, and serve out into a pasta bowl. Why not add capers and sliced black olives to the mix in order to enhance the flavour even further?